Fleet speed can help container shipping lines to manage high fuel prices and low freight rates. 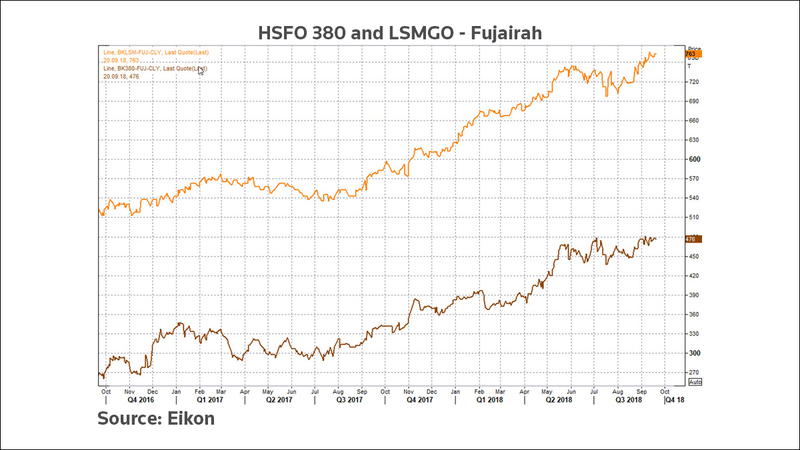 With the help of data and charts from Freightos, find out the impact of “slow steaming” on the pace of global trade. Using data and charts from Freightos, we examine the impact of fuel prices and freight rates in speeding up or slowing the pace of global trade. Slow steaming, where container shipping switches to slower speeds, reduces fuel consumption and helps to restore the supply-demand balance. 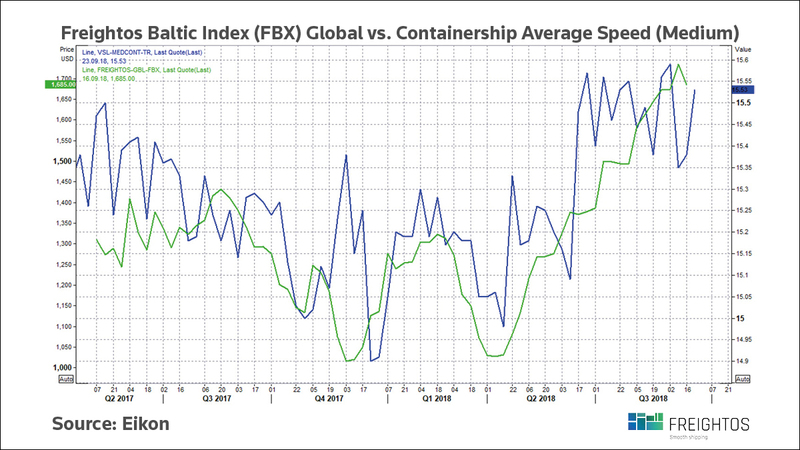 The strong relationship between the Refinitiv Average Fleet Speed and Freightos Baltic Index shows container shipping lines are actively managing fleet speeds. Freight shipping is a vital component in global supply chains, with huge efficiencies being driven by the evolution of containerization and container shipping. 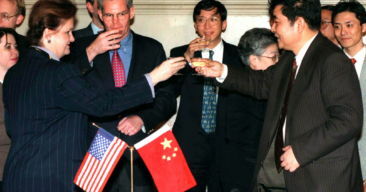 For both companies and consumers, this effectively supports an increasingly intertwined web of global trade. These economies of scale are unlocked by increasingly larger mega container ships, some of which can carry over 21,000 TEUs (Twenty Foot Equivalent Unit). While air freight is typically leveraged for time-sensitive goods, 90 percent of world trade moves by ocean. What determines how fast those goods move? Combining the capabilities of Refinitiv and data from Freightos, we set out to ascertain the role of bunker fuel prices and actual freight rates in speeding up (or slowing) the pace of world trade. 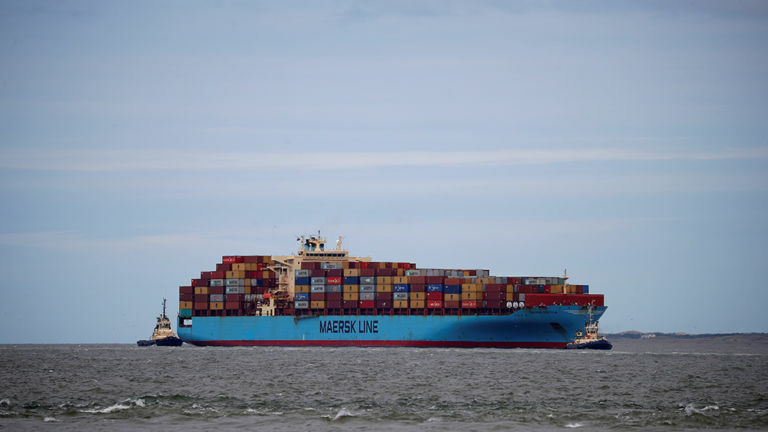 How fast do container ships actually sail? 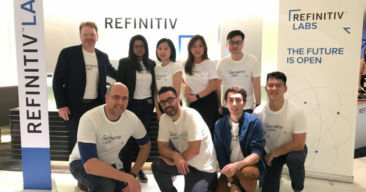 Refinitiv measures the average speed of the global vessel fleet across container ships, oil tankers, gas tankers and dry bulk carriers. For calculating Average Fleet Speed (in knots), our model uses the latest AIS position on a given day (GMT) for each vessel. The average is taken across all AIS speeds for vessels with a position update on a given day. Vessels without updates on a particular day or those that sail at speeds less than seven knots, are maneuvering near ports, or above 23 knots, are removed. Freight rates are divided by the Freightos Baltic Index, which measures weekly price movements of 40-foot containers in 12 major maritime lanes, expressed as an average price per 40-foot container. On the technical side, the methodology leverages experience introduced by the Baltic Exchange, which is in the process of reviewing FBX compliance with new regulations, like IOSCO and ESMA. Bunker fuel costs have been rising steadily. The average price of FO 380 in 2017 was US$328 per metric ton, up about 40 percent in comparison to 2016. This continued to increase in H1 2018 by 25 percent, averaging $408 per metric ton. 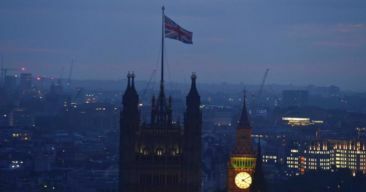 The bunker cost per TEU is estimated at about 40 percent of the fuel oil price in U.S. dollars. The rising fuel costs prompt ship owners to look at ways to optimize operations, with slow steaming being an option besides hedging. The chart below plots the average container ship fleet speed (3,000 – 7,999 TEU) with the fuel oil price. 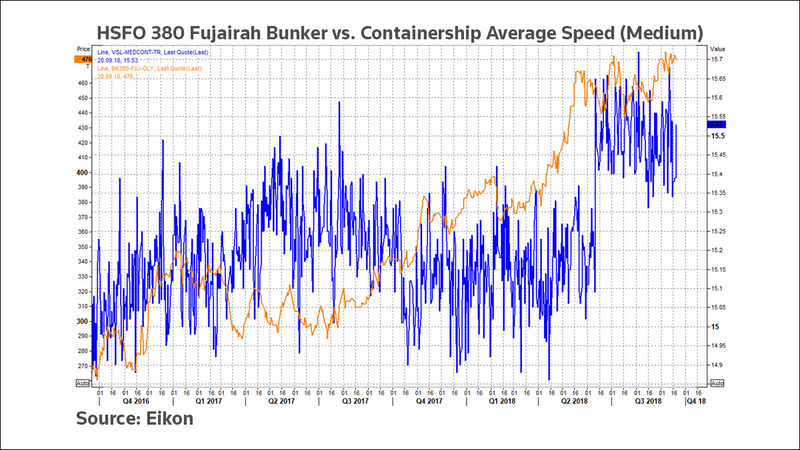 A near-inverse correlation emerges; when bunker prices were low, average fleet speed was high, and when fuel costs rose, average fleet speed decreased. This is by no means a new phenomenon. The practice for a container ship or an oil tanker of deliberately switching to slower speeds to reduce fuel consumption is known in the industry as “slow steaming”, a practice also used by airlines. Fuel consumption is related to the cube of speed. If a vessel travels twice as fast it will consume eight times as much fuel. This is known as the “cube-rule”, making it far more economically viable for a container ship to travel slowly if it can afford to do so from a timing perspective. The “cube-rule” has important implications for the economics of the shipping industry and the design of the new generation of vessels. But upon exploring the impact of freight rates, it seems that speeds aren’t just about fuel prices. This analysis shows that changing trends in demand and freight rate prices are also strongly associated with the average speed of container ships. 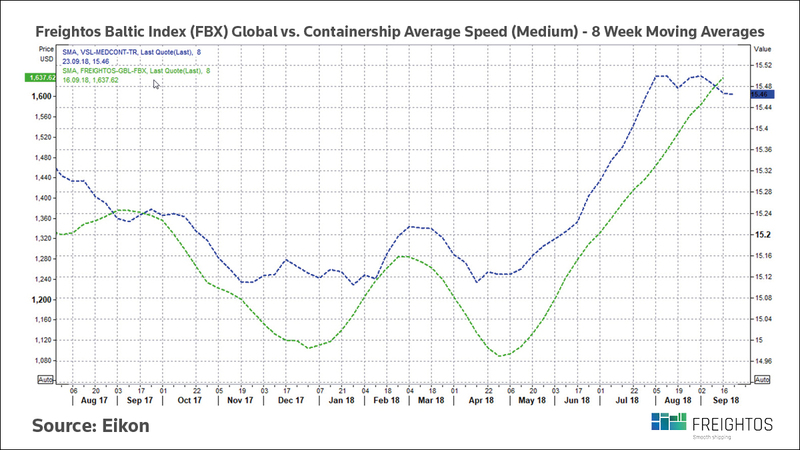 The below charts of the Freightos Baltic Index (FBX) and our Average Fleet Speed for medium container ships shows a good correlation. This stands to reason. Increased container freight rates incentivize ship owners and operators to speed up and get to ports faster. However, when freight rates decline, ship owners tend to reduce speed to optimize costs by reducing bunker fuel consumption, as noted earlier. There is another benefit too. Reducing speed decreases the supply of container ships, which in turn helps restore the supply-demand balance. Further constriction of supply in relation to demand then triggers the increase in freight rates. A study (Barnard, 2010) estimated that slow steaming could absorb about 4 percent of the available container ship fleet. This practice also underlines the importance of data in voyage optimization at the operational level. Even though sailings are set weeks in advance, the underlying reliability of carriers may hold the key to near real-time container speed adjustments; the average carrier reliability of all carriers ex Asia was barely at 70 percent, per CargoSmart. This has had a strong impact on available carrier capacity. A top-ten Transpacific shipper confirmed to Freightos that the stock level of container ships has increased by 12 percent in the last seven years, in part to compensate for varying container speeds. In supply chain theory, we call this the “Whiplash Effect”, or sometimes the “Forrester Effect”. In conclusion, it’s fascinating to see that container shipping lines appear to actively manage fleet speeds to both manage fuel costs and vessel supply, as is evident from the strong relationship between the Refinitiv Average Fleet Speed and Freightos Baltic Index. While on the fleet level changes may appear modest at times, during periods of high bunker fuel prices and low freight rates this cost optimization can be valuable for the container ship owners’ bottom line. Article written by: Zvi Schreiber, CEO, Freightos; Eytan Buchman, VP Marketing, Freightos; Philip von Mecklenburg-Blumental, VP Freightos Baltic Index (FBX), Freightos; Captain Amrit Singh, Lead Shipping Analyst, Refinitiv; and Fabrice Maille, Oil and Shipping Product Manager, Refinitiv.